We also know that we'll be able to play through a career mode that will allow us to work our way up to cooking in a five star restaurant and along the journey we’ll unlock 35 recipes, which have been taking directly from the US series. A nice little touch in the game is that once we’ve unlocked these recipes, we'll be able to print off or share them with friends via email. As far as gameplay is concerned, we can only go on the initial trailer, which shows a fast-paced game, where you need to click and drag items and ingredients frantically across the screen whilst keeping your eye on the pots and pans, which have individual timers that tick down at different times. There also appears to be what we'll label as the 'rage' metre, which fills up whenever we make a mistake. As the trailer shows, once the rage meter is full, Gordon Ramsay will give us an earful. 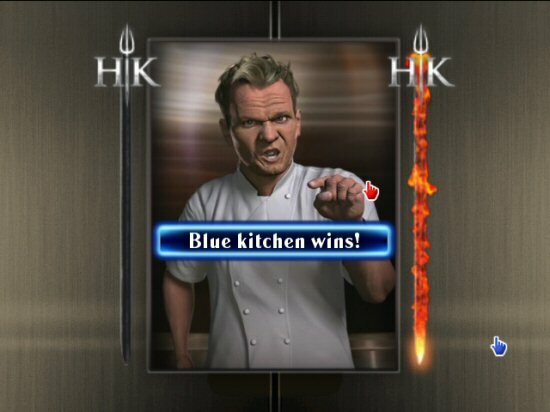 Although 35 recipes doesn’t seem an awful lot and Gordon Ramsay’s appears to have been spending some time at anger management classes, the gameplay in Hell’s Kitchen looks quite addictive. Will it emulate the success of the Cooking Mama series though? Not a chance. Just checked out the trailer, doesn't look too promising in my opinion. No real emotion in Ramsay's voice when he's speaking and unfortunately his colourful language is missing (obviously good when the young 'uns are playing :) ). I could be wrong but it looks like its cashing in on Cooking Mama etc. and not adding anything new and different to the genre.